Srinagar, January 12 (KMS): In occupied Kashmir, the Joint Resistance Leadership comprising Syed Ali Gilani, Mirwaiz Umar Farooq and Muhammad Yasin Malik has said that thousands of Kashmiris have been illegally lodged in jails and the Indian authorities are doing everything to prolong their detention. 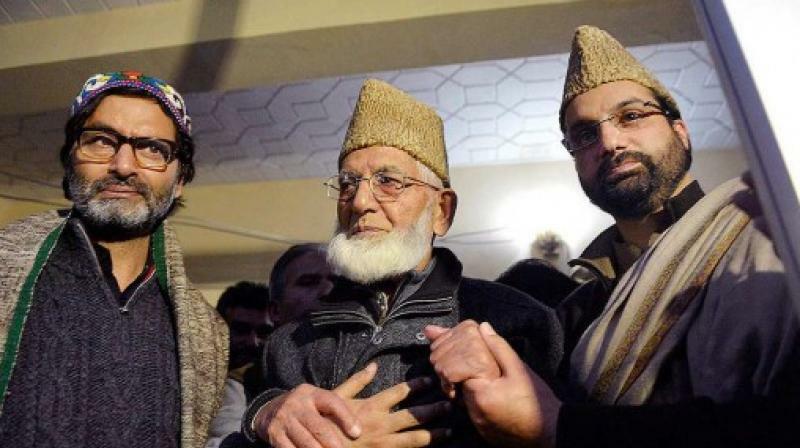 The resistance leaders in a statement issued in Srinagar said that hundreds of Kashmiris were languishing in jails and many were facing trials from a long time and were being denied a bail. They said that from the last year India was suing its investigating agencies like National Investigation Agency (NIA) and the Enforcement Directorate (ED) as a tool to victimize more Kashmiris. They added these agencies had arrested many leaders, Shabbir Ahmed Shah, Altaf Ahmed Shah, Shahid-ul-Islam, Ayaz Akbar, Peer Saifullah, Raja Merajuddin Kalwal, Nayeem Ahmed Khan and Farooq Ahmed Dar besides other Kashmiris including Zahoor Ahmed Watali, Kamran Yousuf, Javid Ahmed and Shahid Yousuf in fake cases. Terming the ongoing spree of killings and oppression as the worst kind of state terrorism, the leaders said that India had given its forces a free hand to kill the Kashmiris. “These killers enjoy immunity from persecution and are killing our youth with impunity and brazenness,” they deplored. Referring to the killing of a youth Khalid Ahmad Dar at Khudwani in Kulgam by trigger-happy killers in uniform, the resistance leaders said that during last month or so, Indian forces killed many innocents including two women. “Though Indian forces are killings the innocent people but the responsibility lies on the shoulders of those pro-India politicians, assembly members and rulers who provide legal cover and immunity to the killers and thus contribute in this genocide,” they added. The resistance leaders reiterated the call for a complete shutdown tomorrow (Saturday) against killings, ongoing genocide of Kashmiri youth and other Indian brutalities and appealed to the people to make the strike a success. Meanwhile, senior Hurriyat leader, Maulana Abbas Ansari, in a statement in Srinagar expressed concern over the recent killing by Indian troops in the territory and described it the worst form of state terrorism. The Jammu Kashmir National Front in a statement issued in Srinagar said that its illegally detained Chairman, Nayeem Ahmed Khan, was being deprived of medical aid in New Delhi’s Tihar Jail. It appealed to the world human rights organizations to take notice of the plight of the Kashmiri prisoners languishing in different jails.